Oh blush, how I love thee. There’s just something so addictive about popping on a little dash of colour and instantly looking a lot brighter and better, and I would be the first to say that I’m a blush fiend. The fun element to blush is that it’s not just the one shade – there’s plenty of different shades to add into the makeup mix and at the moment I’m going for a dreamy little combo of bronzer, blush and highlighter. This year has been all about the bronzer, as far as I’m concerned. I’ve just totally been converted to how a quick swipe of bronze can make the skin look so much healthier and have more shape and definition. 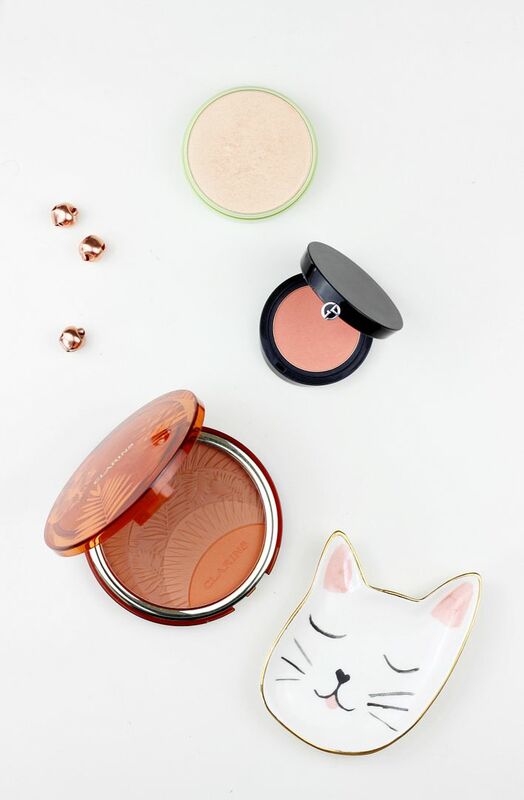 I know, I’m late to the party, but here we are… The Clarins bronzer is one of the most jaw-dropping around – just look at the beautiful embossing! It’s three matte shades that you can swirl together for a flattering warmth to the skin. J’adore. Mixed with that is the prettiest little peach of a blush, the Giorgio Armani cheek fabric in 502. It’s a pale peach toned blusher, so the shade complements the tones of the bronzer really nicely and stops everything looking too warm. The formula is what I’d call a medium blush, in that it’s not sheer and it’s not clown-blush but instead somewhere in between in terms of pigmentation. Although it’s understated, I also find the packaging really chic and I’m feeling it. For a finishing flourish, I can’t resist a dusting of highlighter. One of the prettiest I have is the Pixi Glow-y powder in Santorini Sunset – it’s so delicate and sheeny on the skin and the champagne tones are so flattering on a myriad of skin tones. The powders are a collaboration with Aspyn Ovard, and they are seriously worth checking out (as well as them being one of my absolute favourites and just £14!). The formula is buttery and it melts into the skin when dusted on… it’s just a real treat to use. The downside would be the packaging which isn’t the sleekest but I don’t hate it.